Hong Kong Island offers classic fun for the whole family.Take a sampan boat ride to AberdeenHarbour, soak up the sun at RepulseBay or enjoy spectacular views from VictoriaPeak. Young children will be delighted at meeting Mickey Mouse and the rest of the gang in Hong Kong Disneyland and making friends with sea creatures at Ocean Park. Hong Kong is a shopping paradise, with several large-scale department stores around Tsim Sha Tsui and Causeway Bay shopping districts. Visit Ladies Market or Temple Street Night Market in Kowloon for an inimitable nocturnal experience. Coming to life after dusk, stalls at the former specialize in women's clothing, accessories, and cosmetics while the latter offers a cornucopia of items like watches, leather goods, souvenirs and other gadgets. 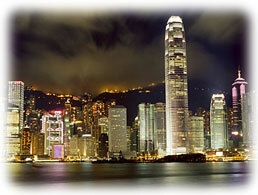 Book a hotel in Hong Kong today and look forward to an unforgettable shopping extravaganza. The hotel Garden View Int'l Houseis situated only minutes from Central, Hong Kong's financial and shopping district. Neighboring are Hong Kong Park and the Botancial Garden. The Peak Tram Station is just a few steps down the road. This hotel Dorsett Olympic is located in Tai Kok Tsui in Kowloon, it is 35 minutes drive away from the International Airport, 8 minutes to the Mongkok KRC train station and about 10 minutes drive to Tsim Sha Tsui. Hotel South Pacific is situated in Wanchai adjacent to the Causeway Bay shopping, dining & entertainment complex "Times Square". To the nearest MTR station Causeway Bay, exit A, it is only 5 minutes walk. The Stanford hotel is located in the heart of the Mongkok district, just 5 minutes walk from the train station and walking distance to popular Ladies Market. The Shamrock hotel is located in the heart of the commercial, shopping and entertainment district of Kowloon, next to the Jordan MTR station and facing Nathan Road. The Wharney hotel is situated in Wanchai District and just 5 - 10 minutes away from the HK Convention and Exhibition Centre and 2 MTR stops from Central. All major public transportation systems including underground (Wanchai MTR) and Star Ferry Terminal (to Kowloon Peninsular - Tsim Sha Tsui district) are within easy access from hotel. The City Garden hotel is located at the edge of the Causeway Bay district, one of Hong Kong's busiest shopping, entertainment and business areas. The closest MTR station is Fortress Hill, it is five minutes walk. The Royal Plaza hotel is located adjacent to the Kowloon Canton Railway (KCR) Mongkok Station, which offers easy access to Tsim Sha Tsui East and the China border and bus terminals are located right beside the hotel. It is conveniently 40 minutes to the airport and 15 minutes to the Nathan Road, which is the shopping hub of Kowloon or 20 minutes to Central Hong Kong. The Nikko hotel is situated in Tsim Sha Tsui East, overlooking the harbour towards the famous Victoria skyline and adjacent to variety of shopping, dining and entertainment venues. The Lanson Place is located to the famous shopping district Causeway Bay. The tram station is just two minutes walk from hotel and the MTR station is just five minutes walk.